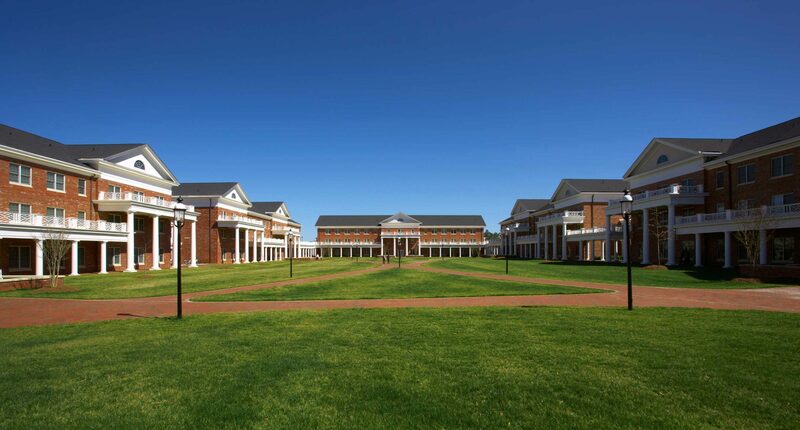 Spillman Farmer Architects collaborated with Elon University to design The Colonnades Housing, a five-building residential village that flanks the Koury Business Center, also designed by SFA. Colonnades Housing is a five-building residential village at Elon University. Two of the five buildings offer all single rooms to students; three are designed with a combination of singles and doubles as well as apartment-style suites that each include integrated common room, bathroom, and kitchenette. The buildings, part of the larger Colonnades quadrangle, feature classic collegiate Georgian architectural style characteristic of the University’s campus. Colonnades Housing flanks an anchor academic building, the Koury Business Center, and is adjacent Colonnades Dining Hall. The buildings are connected by covered arcades and brick walkways, and each includes an outdoor brick patio to encourage community both indoors and out.